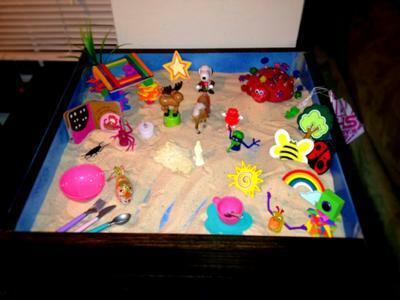 As I reflected on Maslow’s Hierarchy of Needs in this Sand Tray Therapy Exercise, I began to question the extent to which these needs have been met in my personal life. As I look back on my first day’s tray, I see that my physiological needs were met though not indulged; yet they were also tied to a sense of insecurity, fear, and instability, all reflecting the threats to my safety needs as a child. Though I struggled to include these threats to my safety needs, I grew more comfortable acknowledging them as I filled my tray with miniatures and representations that helped me feel safe and protected. These figures, who encouraged my personal sense of love and belonging, remained prominent in my tray throughout the next week and eventually gave way to a sense of personal esteem, satisfaction, and value that emerged over the week. While the ladybug and bridge, personal constructions, are included to signify my aspirations of actualization, creativity, and spontaneity, they are secondary when compared to the needs for safety and belonging. 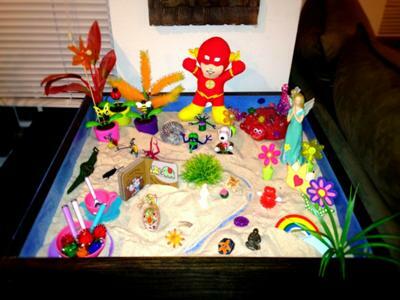 As I entered day two of my sand tray therapy activity, it seems that my physiological needs were increasingly met, which allowed for the development of other needs and qualities.Day three seemed to have the most significant set of changes at once. It seems that my basic physiological needs became less of a concern as they were increasingly met. 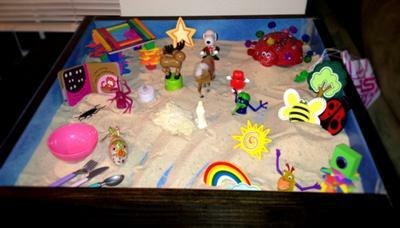 They are also placed together as one scene and are closer to safety needs, perhaps indicating the close relationship of these primary needs. This is where I saw the greatest change in my safety needs. While my vulnerabilities and fears become more prominent and take up greater space in this tray, the barriers and protectors also increase, providing the necessary sense of safety and security that allows me to be comfortable with these threats in my world. As these changes occurred, I also saw changes occur with other need areas. My family miniatures were moved to the back and placed with a great deal of greenery and life, perhaps indicating progress in my belonging needs. Finally, I see my esteem beginning to emerge as I also increase the presence of things and people I value. 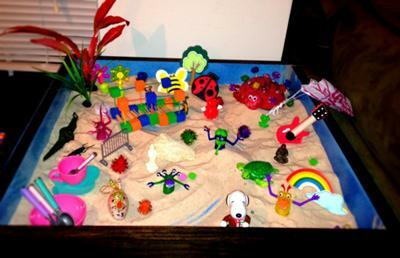 This seems to provide a sense of comfort and warmth for the entire sand tray therapy activity, as indicated by the warm fuzzies throughout. My final tray, filled with growth in the front and back, represents my ongoing journey and attempts to meet my various needs. This tray had little change between days four and five and was especially difficult for me to take down. There is now a sense of reconciliation and added belonging with my family, something I continue to work towards in my daily life. The shaky bridge from previous days is gone and there is an increased sense of safety and ability to manage the threats posed in this world. Esteem becomes more manifest as a superhero is paired with signs of strength and creativity, love and belonging is paired with physical needs, fears are transformed into feelings of bravery, growth emerges in the center of the world, and sea life appears along the waterway, all indicating a move towards greater acceptance of self, past and present experience, and integration of the self.